When cutting concrete, take small 'bites' to prevent the cutting tool jamming; remove concrete in shallow layers. It was found that, when breaking concrete, untrained operators were lifting the breaker without switching off (so increasing the vibration), and were operating continuously for about a minute without moving the cutting tool. The average vibration was about 9 m/s2, which meant that the exposure action value was reached after about 35 minutes trigger time (35 penetrations of the concrete) and the exposure limit value was reached after about 135 minutes trigger time. By training the operators to stop the machine before moving it, the average vibration was reduced to around 7 m/s2, allowing a 70% increase in the time before the exposure action and limit values were reached. 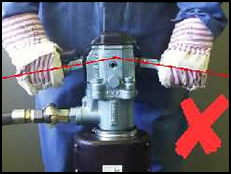 Further training improved the operators’ techniques and the average vibration was reduced to approximately 5.5 m/s2, allowing about 100 minutes trigger time before reaching the exposure action value. Also, by training the operator to stop and move the cutting tool after about 10 seconds of operating, instead of working continuously for about a minute, the amount of work done (concrete broken) was greatly increased. 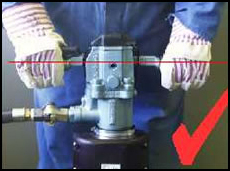 The training produced substantial reductions in the vibration exposures, and enabled the operators to use their tools more efficiently. Up to 17 times more concrete could be broken than before, without increasing the vibration exposures.